Many rodents see your home as a warm shelter abundant with food and sneak inside as unwelcome roommates. We’re looking at types of rodents you may find indoors this season. Mice move into your home for shelter, food and water. They eat up to 20 times a day, making your kitchen an attractive source of food for the winter. These rodents carry bacteria, viruses, fleas, ticks and lice, and their droppings can worsen allergies and asthma. Tree squirrels don’t hibernate in the winter. They often chew holes into your attic as they seek warm shelter. Once inside, they can gnaw through wires and create fire hazards. Their holes also become gateways for other pests, including birds, bats and mice. 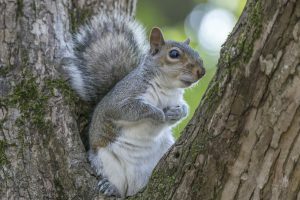 Squirrels will travel up to 10 miles to return to a house or area they like. Again, it’s easier to prevent them from getting inside than it is to get rid of them. Seal off all openings to your house, including screening your chimney, and get rid of garbage often. Chipmunks prefer to live outside, but they sometimes get into a house accidentally. These rodents burrow into the ground, and sometimes their burrows will end up under your porch steps or foundation. Their point of entry is the real problem for homeowners. Like squirrels, their burrows and holes are open invites for other pests to get into your home. Larger rodents will even kill a chipmunk to take over their territory and seek shelter indoors. If you see a chipmunk in your house, try opening your doors and windows to help it find its way out. You can also call us to trap and release it from your home. It’s very unlikely to have a mole in your house. It’s rare to see them above ground in the first place, as they are blind and spend their lives underground. What you think is a mole is most likely a vole or a shrew, though both also prefer to live outside. Of these three animals, only voles are rodents. Voles are often mistaken for mice. They are brown or gray with small eyes and partially hidden ears. They are also called meadow mice or field mice. They are active year-round and like to tunnel underground. The National Pest Management Association reports voles have ruined entire lawns and golf courses with their extensive tunnels. If you see a vole in your house, try setting a trap using peanut butter, sunflower seeds or oatmeal as bait. Shrews are some of the smallest mammals in the world. They eat mostly insects and often use mole and vole tunnels to look for food. Experts at Utah State University say there are not enough shrews or enough damage done by shrews to consider them pests. However, some shrews do climb to eat bird eggs in nests and suet in bird feeders. They can also attack birds or other animals at bird feeders and attack pets. If you see a shrew, do not try to catch it by hand. They will bite, and some shrews have toxins in their saliva. Try using mousetraps set with peanut butter or oatmeal to get rid of it. Read our previous blogs for more facts about rodents and easy do-it-yourself remedies to keep them out of your home this winter. As always, contact us with any questions about pest control or to schedule an appointment with a technician.